Who's In The Driver's Seat? You or Your Inner Critic? You are here: Home / career change / Who’s In The Driver’s Seat? You or Your Inner Critic? Who’s In The Driver’s Seat? You or Your Inner Critic? If your Inner Critic’s in the driver’s seat, it could steer you away from what you really want in life, including a better career. Seriously! I know. I saw her. I have to agree with you there, Nellie. Sigh. So maybe I’m not “Dancing With the Stars” material. Do I always have to be doing something “productive,” Nellie? For those of you unfamiliar with the term “Inner Critic,” it’s the voice in our head that freely offers unsolicited advice, opinions and directives. As the name implies, it is often critical and full of judgment. It’s all about what you should be doing, not what you want to do. A key element of the Inner Critic is that although it may act like it’s there to help and keep you productive and out of trouble, it will never be satisfied. No matter what you do, your achievements will never be enough and you will never be enough. I bring up the Inner Critic because it can be a roadblock when you’re trying to make changes in your life and challenge the status quo. What negative thoughts about yourself tend to occupy your mind? I am not a good enough doctor, wife, mother, sister, friend, etc. And this is from highly accomplished doctors nonetheless! All of us can have negative thoughts and feelings about ourselves, especially when we’ve had a bad day or experience. Negative thoughts are pretty common and can come and go. The problem arises when we buy into them and let them limit us. Step 1. See if you can characterize your Inner Critic. Does it sound like someone you know, perhaps a critical parent or boss? If you could draw it, what would it look like? A drill sergeant? An over-caffeinated rabbit with a stop watch? A perfectionistic taskmaster? A frowning, disapproving version of you? Personifying the Inner Critic distances you from it and helps you identify when it’s in the driver’s seat. Step 2. Do a reality check. Is what the Inner Critic saying really true? Are you not smart? Are you lazy? Are you a failure? Do you have nothing to offer? Objectively question what the Inner Critic is telling you. Step 3. Ask yourself what you really want. Because the Inner Critic jumps in to tell you why what you want is not going to work, and brings up all the what ifs and the potential problems, it’s hard to get very far with a new idea or plan. Write down what you want in a given situation without allowing the Inner Critic to interfere. Give yourself the freedom to explore possibilities free of the Inner Critic’s naysaying. Step 4. Notice what thoughts bring a sense of peace and calm. 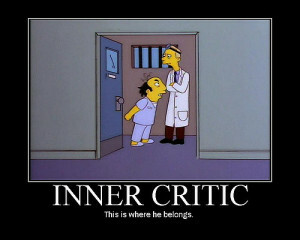 The Inner Critic will tend to make you feel anxious, depressed, agitated, disheartened and stressed. When you are listening to yourself (not the critic), you DO know deep down what is best and right for you. Even when you have to admit hard truths to yourself, or make difficult decisions, there is a sense of peace that comes from being in alignment with who you really are and not who the Inner Critic says you need to be. Step 5. Trust in your own guidance. As you learn to listen to yourself, and not the Inner Critic, you will find your own answers and know that even in the face of uncertainly, you will figure out what to do. Turn up the volume on your own voice, take hold of the wheel, and drop the Inner Critic off at the nearest treatment facility. I really enjoyed this topic and recognized myself with this issue. The negative nurses, patients and sometime other doctors just the way they look at you or don’t listen to you……it feeds the inner critic. Overall I am in a position where I am well liked and very thankful for the good co workers I have now. I have however had lots of pain from co workers and patients that don’t get want they want even when we all know it is inappropriate and sometimes illegal! This was a super concept for me, thank you.